Having directed actor/ rapper/ producer Ice Cube in the 1995 comedy Friday, it’s only fitting that director F. Gary Gray (The Italian Job, Law Abiding Citizen) helm Straight Outta Compton, a biopic covering the formation of rap act N.W.A., of which Ice Cube held original membership. Gray’s most recent film blew away box office expectations to gross the most money ever for an R-rated film opening in August with over $56 million. With N.W.A. members Ice Cube and Dr. Dre producing, Straight Outta Compton gets the seal of approval from the act’s most popular, formative members. Gray presents a suspenseful, dramatic biopic that finds humor when it can and needs to do so. He opens the film in the mid-80s with a young Easy E looking down the barrel of a gun on a deal gone awry until a timely police raid allows him to escape a crack den in a long, tracking shot. 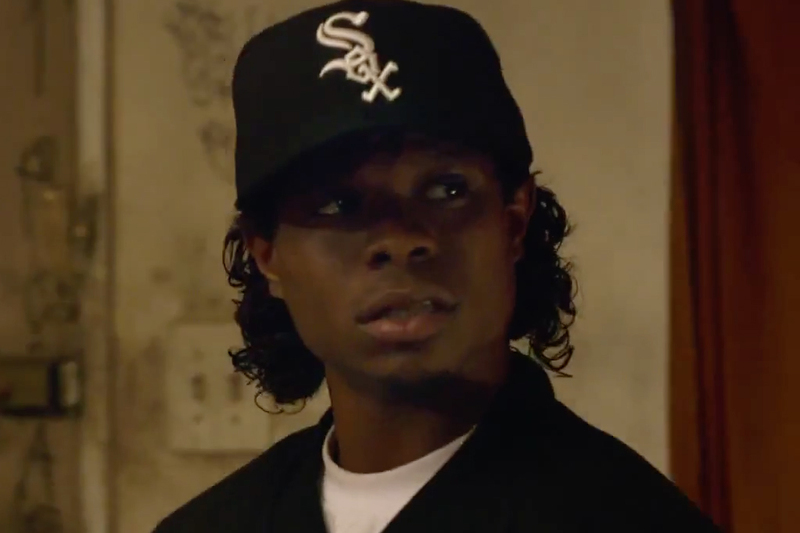 Actor Jason Mitchell (Contraband, Texas Killing Fields) plays E, who provides N.W.A. with capital to record in a studio from selling drugs. Mitchell plays the tragic rapper with angst and energy, even providing the trademark high-pitch voice. He experienced a lot of early success and died of AIDS at the age of 31 in 1995. E serves as one of the film’s three protagonists and his arc gets incredibly predictable in the third act if one knows his story before catching Straight Outta Compton in a theater. The most-interesting bit of casting lies in newcomer O’Shea Jackson Jr. playing his real-life father and producer, O’Shea Jackson Sr. a.k.a. Ice Cube. The resemblance looks uncanny with Jackson taking after a younger version of his rebellious, talented father. Gray introduces Ice Cube while giving the audience some perspective. While he writes lyrics on the way to school, a car full of Bloods pull Ice Cube’s school bus over to threaten students who jokingly flashed gang signs out the window. Terrifying and suspenseful, Gray gives the audience a taste of the immediate violence and brutality from gangs and law enforcement that our protagonists faced on a constant basis. Who better to direct a movie about Ice Cube than a man who already directed him? Corey Hawkins (Iron Man 3, Non-Stop) plays the third of three protagonists, Dr. Dre. Hawkins provides Dre’s unmistakable blend of talent and confidence, mixing the music for N.W.A.’s debut album of the title’s namesake, Straight Outta Compton. The film's success comes at no small feat with controversy surrounding the project ever since the early days of production in the casting stage when a racist, misogynist casting call went viral and was seen across the web. Matters were made worse when MC Ren, another N.W.A. former member, did not approve of the film to cast doubt over the film’s historical accuracy. A week into production, a drive-by shooting happened on-set in front of the cast and crew that resulted in the injury of a civilian. Later on in production, music mogul Suge Knight was involved with a hit-and-run case that began with an on-set argument, killing record producer Terry Carter and injuring filmmaker Cle Sloan. R. Marcos Taylor (Broken Angels) plays Knight as a violent megalomaniac who bullies Dre and E in the third act. Record producer Jerry Heller, portrayed by a greedy, shady Paul Giamatti (Cinderella Man), objected to his villainous portrayal in the film as a character creating a rift between Easy E and his friends in N.W.A. Despite the controversy, Gray’s finished product deserves the opening weekend windfall it experienced. Presenting historically documented material with an element of suspense puts Straight Outta Compton in the same league as recent films Argo and The Social Network. Cinematographer Matthew Libatique (Black Swan, Iron Man) provides some of his best camerawork, especially during a long shot featuring the rappers enjoying themselves on tour in a scene resembling Littlefinger’s brothel from “Game of Thrones.” The camera follows them in a tense situation between joining rooms that ends with the threat of gun violence in an upscale hotel corridor. Straight Outta Compton stands as an exemplary gritty road trip biopic as Gray manages to demonstrate the growing nationwide violence in the early 90s that extended beyond Rodney King and the Los Angeles riots. Concerts in Detroit, Cincinnati, etc. display a struggle existing beyond Southern California. Gray doesn’t glorify the depicted gun violence, but instead indicts historical acts of senseless shootings and beatings. These characters come from a violent background and express their experiences and displeasure through music, seeking social change with filmmaker Gray prominently using the N.W.A. song “F*** tha Police” throughout the second and third acts to show a conflict still existing in 2015. Ironically, cinemas nationwide had police officers present due to the recent movie theater shootings. This preventative measure does not seem to have discouraged viewers from buying a ticket if the box office serves as an indication. F. Gary Gray’s newest film set August box office records shortly after industry analysts suggested 2015 would not experience the boost last August had with Guardians of the Galaxy and Teenage Mutant Ninja Turtles. The historical perspective of the L.A. riots proves relevant in 2015, reflecting recent riots in Ferguson and Baltimore. The three leads take center stage and give career-making performances, with O’Shea Jackson Jr. standing out as his own father. Straight Outta Compton has emerged as the breakout hit of the summer with an unexpected big haul at the box office for its opening weekend.